New York University Press, 9780814723883, 336pp. Joel Osteen, the smiling preacher, has quickly emerged as one of the most recognizable Protestant leaders in the country. His megachurch, the Houston based Lakewood Church, hosts an average of over 40,000 worshipers each week. Osteen is the best-selling author of numerous books, and his sermons and inspirational talks appear regularly on mainstream cable and satellite radio. How did Joel Osteen become Joel Osteen? How did Lakewood become the largest megachurch in the U. S.? 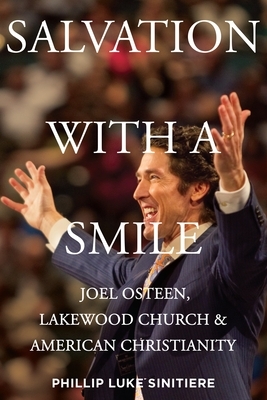 Salvation with a Smile, the first book devoted to Lakewood Church and Joel Osteen, offers a critical history of the congregation by linking its origins to post-World War II neopentecostalism, and connecting it to the exceptionally popular prosperity gospel movement and the enduring attraction of televangelism. In this richly documented book, historian Phillip Luke Sinitiere carefully excavates the life and times of Lakewood's founder, John Osteen, to explain how his son Joel expanded his legacy and fashioned the congregation into America's largest megachurch. As a popular preacher, Joel Osteen's ministry has been a source of existential strength for many, but also the routine target of religious critics who vociferously contend that his teachings are theologically suspect and spiritually shallow. Sinitiere's keen analysis shows how Osteen's rebuttals have expressed a piety of resistance that demonstrates evangelicalism's fractured, but persistent presence. Salvation with a Smile situates Lakewood Church in the context of American religious history and illuminates how Osteen has parlayed an understanding of American religious and political culture into vast popularity and success.